Figur: Location of trail sites. SCANTURF is a variety testing program organized by the turf grass seed industry and researchers in Denmark, Sweden, Finland, Iceland and Norway. The program commenced in 2005 and is entirely funded by entrance fees. The program includes optional testing for short cut lawns (fairways, mowing height 10-20 mm) and turfgrass areas exposed to football-type wear (mowing height 25-30 mm). The testing period is one seeding year plus three evaluation years. Trials are started every second year: 2013, 2015, 2017, etc. SCANGREEN is a variety testing program for golf greens cut at 3-5 mm. The program started in 2003 and is funded 90 % by the Scandinavian Turfgrass and Environment Research Foundation and 10 % by variety entrance fees. The testing period is one seeding year plus three evaluation years. Trials are started every fourth year: 2011, 2015, 2019, etc. SCANTURF considers the five Nordic countries as one trial zone. Variety testing is carried out at Landvik, Norway, Tystofte, Denmark and Ylistaro, Finland. Testing for short-cut lawn is carried out at all three sites. Testing for football-type wear is optional and carried out at Landvik only. 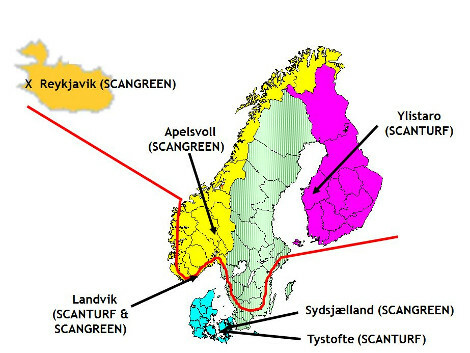 SCANGREEN separates the Nordic countries into two trial zones. The northern zones includes Finland, Iceland and northern, mostly continental parts of Norway and Sweden. The southern zone includes Denmark and southern, mostly coastal parts of Sweden and Norway. Trials sites are Landvik, Norway and Sydsjælland GC, Denmark, in the southern zone and Apelsvoll, Norway and Ylistaro, Finland in the northern zone.